This Franklin Treasury is a special gift from Franklin's family to yours. Here are four well-loved Franklin stories: Franklin Goes to the Hospital, Franklin's Baby Sister, Franklin and Harriet, and Franklin Says I Love You. 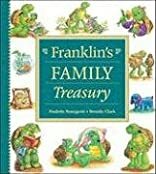 In this collection, Franklin discovers that though he may face many challenges as he grows up, he will always have the love and support of his family.